Recovering from addiction is an intense process built around a series of questions: How do you create lasting freedom from substance abuse? How do you keep yourself from the drug that has been the central focus of your life? How do you say no when your brain’s first instinct is to say yes? As addiction becomes more fully understood as a chronic medical disorder, a growing number of clinicians and addicts alike are discovering that relapse prevention medication is a critical part of the answer. 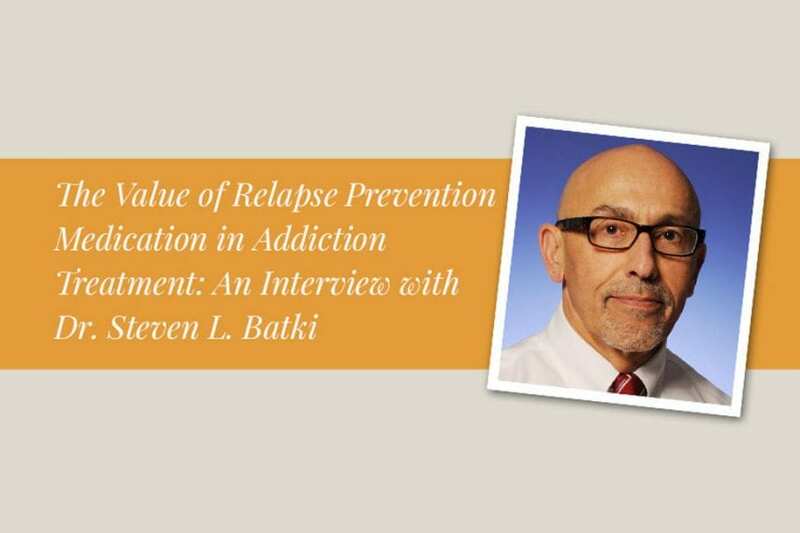 Dr. Steven L. Batki is an expert on relapse prevention medication. He is a professor of psychiatry at UCSF School of Medicine, board certified in Addiction Psychiatry and Addiction Medicine, and has over 30 years of experience in the field. He is considered one of the top addiction medicine physicians in the country and a leading authority on evidence-based medical treatment of addiction. He serves as Alta Mira’s consulting Addiction Psychiatrist, overseeing the psychiatric and addiction medicine needs of all of our clients, creating sustainable paths toward healing using the most effective, modern therapies available. In this interview, Dr. Batki shares his insights on relapse prevention medication and the extraordinary role it can play in the recovery process. Still, as Dr. Batki says, “We don’t have proven relapse prevention medications for all substances.” Currently, there are no medications with proven effectiveness for addiction to marijuana, hallucinogens, or stimulants such as cocaine or methamphetamine. But for the millions of people struggling with alcohol, opioid, or tobacco use disorders, there are safe and effective pharmacological treatments that have been shown to have a profound impact on treatment outcomes. Not only do these medications reduce the impetus to use pharmacologically, they can also give you the psychological space to more fully participate in the healing process. Without the overwhelming cravings and constant obsession with using, you are able to engage in the therapies and self-reflection you need to create meaningful emotional and behavioral change. Naltrexone (in the oral tablet form): Naltrexone is an opioid antagonist that can be taken as a once-a-day oral medication that reduces cravings and decreases the pleasure of alcohol consumption. Patients with high levels of craving for alcohol may find naltrexone useful. Vivitrol: Vivitrol is naltrexone in a monthly, extended-release injectable form. Antabuse: Antabuse (disulfiram) is an oral medication that produces intensely unpleasant physical effects if alcohol is consumed by raising the levels of the alcohol metabolite acetaldehyde. People who want to place a barrier between themselves and alcohol may find it useful. Campral: Campral (acamprosate) is an oral medication that normalizes the brain activity that has been dysregulated as the result of chronic alcohol use, reducing withdrawal symptoms and reducing cravings. Campral can be challenging as patients need to take 2 pills 3 times a day. Topamax: Topamax (topiramate) is an anticonvulsant and migraine-prevention medication that normalizes neurotransmitter activity to reduce craving for alcohol. It can be very effective but has more side effects than other medications. My view is that anyone who has a serious enough alcohol use disorder to require treatment also has a severe enough problem to require relapse prevention medication. All current national addiction treatment guidelines recommend that patients with serious alcohol use disorder be offered relapse prevention medication in addition to the rest of their recovery plan — just like anyone with severe depression would be offered antidepressant medication in addition to psychological treatments. Vivitrol: Vivitrol is a monthly, injectable form of Naltrexone, an opioid antagonist that acts on opioid receptors to block the effects of opioids and reduce craving. A single injection of Vivitrol can block the effects of heroin or other opioids for an entire month. Vivitrol is a treatment of choice for individuals who want to be opioid-free. Buprenorphine: Buprenorphine (Suboxone) is a partial opioid agonist that reduces the euphoria of opioids while suppressing craving and physical withdrawal symptoms. Unlike methadone, buprenorphine is available by prescription in physicians’ offices, and you do not need to be in a formal opioid treatment program to access the drug. Buprenorphine is much safer than full agonist opioids like methadone, morphine, or heroin. Methadone: Methadone is a full opioid agonist that blocks the high of opioids while reducing craving and alleviating withdrawal symptoms. Methadone may be used both in early recovery and as maintenance treatment, but is only available via highly regulated opioid treatment programs and often requires daily attendance at special clinics that provide this medication. Despite the immense benefits conferred by relapse prevention medications, they remain woefully underused, particularly in alcohol addiction recovery. A recent article published in the New York Timesrevealed that only 2% of those seeking treatment for alcoholism received relapse prevention medication, despite overwhelming evidence of its efficacy. Dr. Batki believes that moralistic, non-medical attitudes about the nature of addiction, recovery, and abstinence are partially to blame. Part of it is rooted in a very narrow view of the recovery process that involves non-medical moral judgments about what treatments for addiction are acceptable. An extreme version of that philosophy holds that taking any sort of medication, even non-abusable ones such as Vivitrol, or antidepressants or mood stabilizers, is seen as a ‘crutch’ or something that maintains ‘dependency.’ Some addiction treatment providers don’t encourage patients to ask for these medications—or they actively discourage them. This narrow interpretation of the meaning of abstinence stands sharply at odds with best medical practices and currently accepted treatment guidelines, and can create significant barriers to healing. At times, patients themselves are reluctant to try relapse prevention medications, in part because they have been told that it is at odds with an abstinence-based approach to recovery. But Dr. Batki sees things differently. I define abstinence as abstinence from drugs of abuse. I don’t consider medications drugs of abuse, since treatment medications can help avoid relapse. Achieving abstinence from a drug of abuse requires the use of everything that’s scientifically proven to help – 12-step programs, counseling, and the use of relapse prevention medications. He maintains that relapse prevention medication doesn’t interfere with abstinence, but instead helps create the path toward it. This individualized approach to addiction treatment in general, and relapse prevention medication specifically, can allow even those who have struggled with years of chronic relapse to finally find freedom from substance use. Dr. Batki recalls one particular client who suffered from alcohol addiction, who had never been able to go more than a week or two without drinking. “She was a young woman in her 20s with two children, lots of family stress, and a very severe mood disorder that co-occurred with the alcohol use disorder,” he tells me. “She was a very high-risk patient.” During her time at Alta Mira, she began receiving Vivitrol injections in addition to psychotherapy, AA meetings, and antidepressant treatment. She has now been sober for over a year, and relapse prevention medication was a central component of her healing—as it is for so many others. By providing tailored care that integrates the best approaches to addiction treatment, Dr. Batki and the rest of the Alta Mira team are able to guide clients toward new, sustainable paths to recovery, and unlock their ability to create true transformation. There is no one-size-fits-all answer for all people with addictions. Just as with any other medical illness, medical treatment really has to be tailored to the individual, and I think that’s the core of our approach to addiction treatment at Alta Mira. Alta Mira provides comprehensive evidence-based treatment for people struggling with substance addiction as well as co-occurring mental health disorders and process addictions. Contact us to learn more about our renowned programs and how we can help you or your loved one start the journey toward recovery.